Posh Diary: Top 20 'best-value' buys in Peterborough United history. If Lee Tomlin’s £1.5 million move from Posh to Middlesbrough goes through at the end of the season it will represent an approximate 10-fold profit on a player who made a reasonable contribution to the club in his four years at London Road. Lee Tomlin’s appalling disciplinary record (as well as a very competitive field) stops me including him in my list of the top 20 ‘best-value’ buys in Posh history. I’ve taken length-of-service, honours while at the club, the ability of the player and profit into account. A great competitor who was a key performer in two of the best Posh seasons of all-time, the play-off win at Wembley in 1992 which secured successive promotions and the best finish in the club’s Football League history the following year. A poor second spell at the club shouldn’t dilute his achievements. One of the best finishers ever seen at London Road. He scored in his first four games for the club and never really stopped. Part of a Posh team that kept missing out on promotion from Division Four, but it was hardly his fault. Once he broke into the first team he delivered the best and most consistent goalkeeping displays I’ve ever seen at Posh. He played at a higher level than David Seaman for Posh and made the club more money so he’s the ‘best-value’ keeper signing the club has ever made. Signed: £4,000 from Arsenal (1971). A man who has made the third-highest number of Football League appearances in the club’s history cost under 5K. Carmichael was involved in the 1973-74 Fourth Division title-winning side and his consistency was second-to-none. Left: Free to Swedish football in 1975. Hill was the touch of class that transformed Noel Cantwell’s team into Fourth Division champions. He was getting on a bit when he arrived, but his passing range and set-piece class ensured it was money well spent. Part of successive promotions towards the end of a lengthy spell at London Road. Always gets a mention in a discussion about the best-ever Posh right-backs. One of the most exciting players to grace the London Road turf in the last 20 years, Scorer of great goals, most notably his play-off semi-final hat-trick against Barnet in May, 2000. His loyalty was finally rewarded with a ‘celebratory’ game against his boyhood club Aston Villa six years after he quit playing for Posh. The late Keith Alexander could spot a player. He was responsible for identifying the entire Holy Trinity of Boyd, Mackail-Smith and Mclean, who were all brilliant Posh players who went on to bigger and better things while making their former club a vast profit. The biggest Posh transfer coup of all-time. ‘The Doog’ should never have played in Division Three, but he spent two terrificly-entertaining seasons at London Road before departing. Dougan scored one of the goals in the famous FA Cup win over Arsenal which on its own demands he is included in this list. Barry Fry still seethes about this transfer as he is adamant he could have wrung more in sell-ons etc from Wigan. It still represented an excellent profit on a player who cost Posh nothing and was generally outstanding in a poor side. Left: £325,000 to Norwich (2003). A high-class player who carried some struggling Posh sides with his finishing skills. Averaged a goal every other game before moving on to Norwich City for whom he appeared in the Premier League. A Posh record 559 appearances and 128 goals, the second-highest in the club’s Football League history. He spent 13 years at London Road and starred in a Division Four title-winning season - all at a cost of just £20K. Bly boasted a ridiculous goals-per-game record when he left Posh. His Division Four record of 52 goals in his first season at London Road helped deliver the title in the club’s first season in the Football League. Left: Both left for nothing in 1994, Adcock to Luton, Barnes to Partick Thistle. Posh apps: Adcock 130 (39 goals), Barnes (60, 9 goals). I’ve kept them together as they arrived in the same £40,000 deal from our local rivals. Posh took advantage of Cobblers’ financial problems to bring two top players to London Road on the cheap. Both were outstanding as the club clinched back-to-back promotions in the 1991-92 season. Posh didn’t make a huge profit on one of the most gifted players ever to pull on a blue shirt, but the joy he delivered with his classy and committed displays make him a bargain buy. He played a huge part in three Posh promotions under Darren Ferguson’s management. King Ken’s first spell at London Road didn’t actually last that long, but two goals at Wembley in a play-off final that secured back-to-back promotions and a first-ever season in the second tier of English football for Posh cannot be measured in mere monetary terms. Charlery even managed to return to Posh after leaving twice without diminishing his cult hero status. Posh fans of a certain age will tell you that Emery is the best player they’ve ever seen at London Road and his statistics back that argument up. Emery must be the most decorated Posh player of all-time as he was part of five successive Midland League title-winning sides and the team that won the Fourth Division title in 1960-61. Signed: £500,000 from Dagenham & Redbridge (2012). Left: £6 million to Crystal Palace (2013). Based purely on profit Gayle is the club’s best-ever signing. 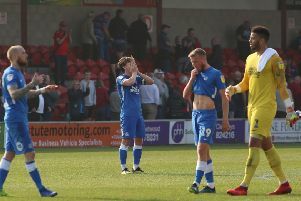 Posh made a whopping 1,100 per cent profit in just six months, but the fact that his sole spell at the club ended in a relegation keeps him off top spot. The best player I’ve ever seen at London Road. Great attitude and improved his skills considerably in his time at Posh. Key man in three promotions and left on a high for a massive profit after helping Posh back into the Championship in 2011. So a player who didn’t earn Posh a penny in transfer profit is my best-value signing of all time? Contentious? Maybe, but what Halsall gave in terms of leadership, passion and commitment can’t be measured financially. Halsall was bought with money raised by the fans and he re-paid them handsomely many times over by skippering Posh to back-to-back promotions. He led by deed as well as word by playing as hard and with as much spirit as he demanded from the rest of the squad.